Guest bathrooms tend to be afterthoughts, but little touches can go a long way toward making them more inviting. This article was featured in this months Moen Trade Resources publication and features AK's Ed Cholfin! We've all seen what serves as a guest bath in most homes: a plain room with a 30-inch vanity, unframed mirror topped with a three-bulb light bar, toilet, shower/tub combination and towel bar. But it doesn't have to be that way. Here are seven ways to make a basic guest bath a place that's both useful and inviting to a tired traveler. Storage niches. Haley Hougen, president and CEO of Dallas-based HD Remodeling, includes two shampoo niches in nearly every bathroom he remodels. "It saves a ton of space in the there," he says. they're equally handy outside the shower as a place to tuck away towels, books and decorative items. The right lighting. 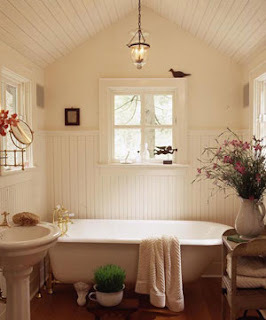 Ed Cholfin, president of Atlanta-based AK Complete Home Renovations, says that in a guest bath, he typically adds lighting directly over the sink area and adds a can light or a combination light/exhaust fan over the tub area. "If it's a can, we can control it with a dimmer if they want to have a relaxing bath," he says. "We like to add mood lighting in addition to work lighting." He says that dimmers are also a perfect way to offer guests a night light in unfamiliar surroundings. A curved shower rod. These easy-to-install shower rods are standard in upscale hotels because they provide bathers with extra elbow room in the shower. A high-quality ventilation fan. "I think our strongest sense is the sense of smell," says Denver-based designer Judy Pepper, principal of Pepper Design Associates. She says a good ventilation fan will ensure fresh air, and that guests will be more likely to use it if it's quiet. A towel bar hook. A simple but ingenious amenity, a towel bar hook provides a convenient place to hang everything from a nightgown or necklace to a toiletries bag. Moen offers decorative hooks that snap securely into place on round towel bars, and come in matching chrome, brushed nickel, or old-world bronze. Accent tiles. Fancy accent tiles that would be cost-prohibitive in a master bath can be quite affordable on a smaller scale. Cholfin likes to add mosaics, medallions and tiles with texture. They not only add visual impact, but they also make wet floors safer. Placing floor tiles on the diagonal will make the room look larger. A towel warmer. This is a feature typically found only in master baths, but with retail costs of low-end units starting at less than $200, it's an affordable upgrade. And it would make anyone feel pampered. "Your guest would love that," Hougen says. "They'd probably go home and buy one of their own!" Is The Era of Huge Homes Over?